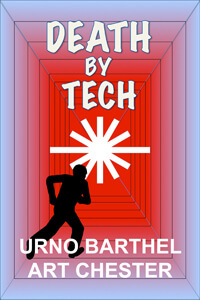 Fiction about life in the research laboratory, by Art Chester writing as Urno Barthel. The principal character and narrator is Evan Olsson, a computer scientist working at a research lab overlooking the Pacific Ocean in southern California. What happens when a scientist’s peaceful life is disrupted by violence, murder and deadly threat? These mystery novels start at a comfortable pace and accelerate to a climactic finish. – Death By Probability (Evan Olsson #1) is available in paperback at Amazon and Barnes and Noble and in e-book versions for Kindle, Nook and iBook. – Death By Tech (Evan Olsson #2) is available in paperback at Amazon and Barnes and Noble and in Kindle and Nook e-books. 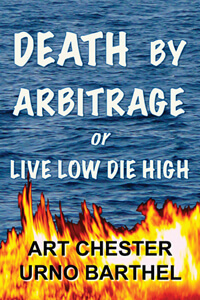 – Death By Arbitrage or Live Low Die High (Evan Olsson #3) is available in paperback at Amazon and Barnes and Noble and as a Kindle and Nook e-book. The publisher Outskirts Press offers all three books in either paperback or PDF version: #1, #2 and #3. Respected Kirkus Reviews has published reviews of all three books HERE. Insider trading – white-collar crime. It’s harmless to everyone except a few investors. Or is it? Consider a hedge fund that blocks emergency calls, making profitable trades while people lie dying. Computer scientist Evan Olsson discovers a company that’s willing to commit murder to fatten its profits. With good friends, technology and a robotic transformation, he uncovers the hidden tricks of their business. Unfortunately, Evan becomes prey as well as pursuer and finds his life in immediate danger. As he tries to dodge a murderous adversary, Evan has to deal with risk of a different kind: an imminent explosion as the two women in his life collide. A totally secure meeting, in a totally secure laboratory, every attendee cleared and confirmed. How did two unknown gunmen suddenly appear, threatening twenty people with a powerful laser beam and viciously attacking the chief engineer? Evan Olsson hears the screams of victims and smells burning flesh as he pursues the criminals from the room only to stumble over his favorite security guard, dead in a pool of her own blood. The mysterious crime is revealed as part of a larger plot when a powerful laser is stolen by high-tech means. Evan and his FBI partner Matt discover an international conspiracy to attack L.A. infrastructure and murder global leaders. They reach the heart of the plot but find themselves trapped deep underground by the criminals as the conspiracy reaches its deadly conclusion. Death By Tech plunges Evan and Matt into a whirlpool of liaisons and betrayals as they seek bits of truth that can be trusted. Their work is undercut and placed in jeopardy by even their closest allies, who seem to have sinister agendas of their own. Evan’s problems are compounded by shocking developments in his love life. He will need all his skill and luck to get through this case and regain his optimistic faith in the future. Evan takes over the mentor’s project and with a reluctant FBI partner uses computer science and nanotechnology to unravel the mystery. With his personal safety at risk he tracks the mastermind to the Malibu area. The criminals up the stakes by paralyzing a regional energy network, accelerating their plans for a devastating national attack just days away. Nature disrupts everything with a disaster that helps Evan unmask the criminals but requires him to flee for his life. Death By Probability pursues a mysterious death to its ultimate secret. Technology and fringe science, friendship and romance, computer intelligence and human frailty –- all these help solve a mystery that builds to a fast-paced climax. 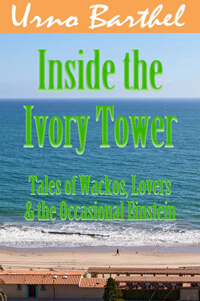 Short stories about life in the research lab, and the characters in the novels. These stories cover Evan Olsson’s life at HAL up to the beginning of the first mystery, Death By Probability. They’re not mysteries, and they’re not science fiction either. I hope you enjoy them! Evan Olsson, a young computer scientist, shows how NOT to start a new job. Evan confronts a personal crisis at the research laboratory. Evan learns what happens after hours in the laser lab. Evan’s summer romance turns into a beastly adventure.